What are the long-term goals of this company? What are other teams working on? What is my purpose at this company? Am I even doing a good job? These questions tend to be the result of two things: a lack of access to information and communication. That is why complete transparency is key to a healthy business and company culture. Here at Pyramid Solutions, we don’t want our employees to ever ask themselves these questions. As a technology company that has been profitable for all of its 30 years in business, we owe a lot of that success to the collaborative environment we foster through regular meetings and townhalls, technology that promotes easy collaboration and communication and even the physical architecture of our office. We want everyone to be aware of every process, project and major decision. When employees are equipped with this information, a number of synergies begin to occur. One of them, and a (not-so) secret to our company’s success, is real innovation from constant, honest and informed collaboration. We know innovation can come from the post-grad engineers to the senior strategic decision makers, and having a transparent culture empowers and entrusts all our team members to participate in the processes that will benefit our partners and clients. 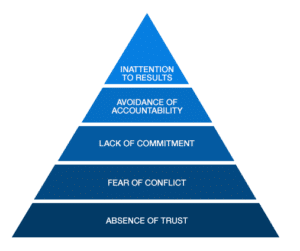 Perhaps you’re familiar with the “5 Dysfunctions of a Team” model that describes the causes that will ultimately lead employees not to care about the work they’re doing. We take this model very seriously at Pyramid Solutions, but we like to take it one step further. What causes the absence of trust? We believe that’s a lack of transparency in a company. As the foundation for this model, we make sure employees can share with leaders if they’re unhappy, have the right resources and tools to make good decisions, and are always learning and expanding on their skills. Here are a few of the employee benefits of transparent company culture here at Pyramid Solutions and why it’s exactly where you need to be in order to grow, learn and, most importantly, love what you do. You know you can trust your colleagues and superiors. We conduct performance reviews quarterly that not only consist of a chance to openly communicate with your direct supervisor about your perceived struggles and victories, but colleagues are also encouraged to participate in a holistic discussion of the team’s performance. The purpose of these is to build reciprocal trust to the point where employees feel comfortable being honest about how they feel in their current position and where they would like to be. Just like our physically open office, departments are very fluid and not siloed. This gives employees opportunities to collaborate as well as learn about other teams’ projects and processes. This 360-degree of the company empowers employees to seek out projects they are interested in and actually be involved in the decision-making if they want to be. This is another indicator to leadership as to what position an employee may be happier in. This frequent engagement between colleagues and departments empowers employees to determine their own responsibilities and position within the company and allows leadership to help make that determination, which leads us to our next point. 2. Be equipped with the necessary tools and resources to make your own decisions. There are tons of opportunities to collaborate. Yes, our employees have the opportunity to make decisions in different projects, but you also have the freedom to decide how they want to communicate, collaborate and succeed. We put the technologies in place that allow for easy communication. Our calendars are available for anyone in the company to see and make scheduling discussions easy, it’s normal for a small group to spontaneously hop into one of our glass conference rooms and there are always plenty of conversations happening around the office. With this, we put our employees in charge of their own success, because collaboration is key to success. There are no limits as to what you can achieve. Not only is technology a driving force for transparency at Pyramid Solutions – our open offices and transparent glass conference rooms offer a lot of information themselves. For example, it’s common for our entry-level employees to have a 25-minute conversation with the president of the company in passing. All kinds of information is discussed openly in our office from performance to financial matters because we believe anyone should be able to offer their insight on how to drive that. 3. We learn and grow… a lot. 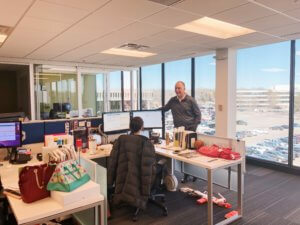 If you were to pass any of our transparent glass conference rooms at any hour of the work day, you’ll see a lively and engaged meeting around a new product, new software feature or strategy. These honest debates are the result of timely collaboration without any pretense or bias. You can see just passing by that the energy and excitement around new features being developed and percolating innovation is contagious. The fact that we’re open to any and all suggestions fosters innovative thinking. You’ll contemplate ways of thinking you never would have considered before these discussions. Even a certain idea doesn’t end up determining the course of action, it might have created a leaping point to other ideas and may lead to innovation down the road. But most importantly, it creates educational and thought-provoking conversations. We make sure employees are comfortable and trusting enough to share concerns about a course of action, ultimately allowing the entire team to debate, reflect and understand why certain decisions were made. Everyone is always learning; no matter their level in the company, the personal development never ends. As one of the leading partners in automation technology, we know innovative ideas come from everywhere. That’s ultimately why we’re committed to creating a culture of total transparency. Through the physical architecture of our office to the technology we have implemented, we make sure every employee is empowered with the information and resources they need in order to easily collaborate and learn. Ready to flourish with a transparent company that values your insights? We’re hiring– and we can’t wait to hear from you! About the Author: I love working on everything content-related here at Pyramid. I love animals and pizza, and in my free time I like to practice yoga and spend time with friends and family.